So we have two potentially interesting developments since last update. The second is NDX, which has reached a bear inflection point. 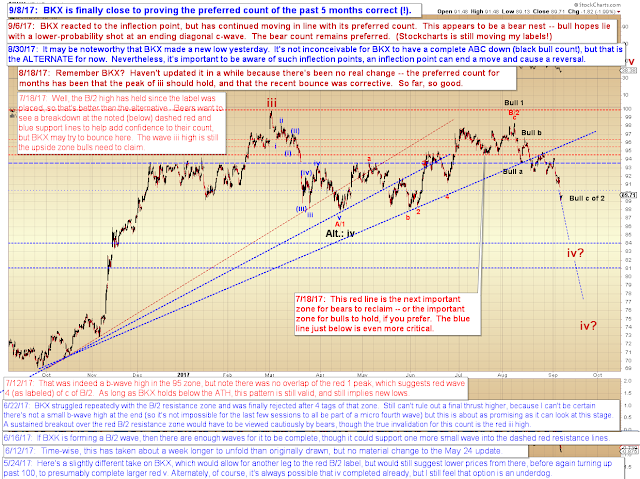 The rally since last update has, so far anyway, taken the form of three waves, which count as complete. As long as NDX doesn't rally immediately north of 5981, then intrepid bears could treat that high as the labeled 2/B wave and short against it if they're so inclined. If attempting such, do keep in mind that 6009 is the more critical zone, because we can't yet rule out all the potential near-term patterns that could briefly head-fake above 5981 without killing the bear case. 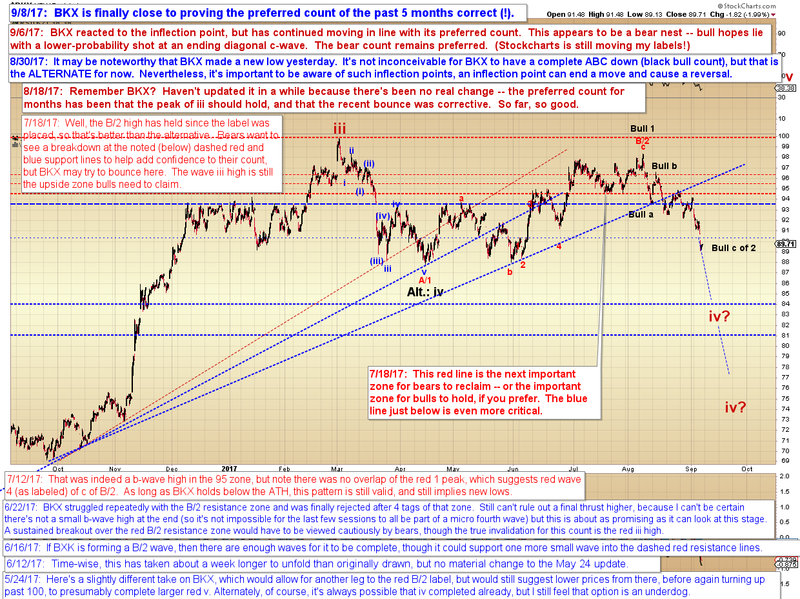 Finally, SPX is still the odd man out, and its pattern leaves much to interpretation. Given the state of BKX and NDX, I'm somewhat inclined to think SPX will probably at least test the lower black trend line -- and possibly head quite a bit beyond that (the black B/2 and red Bear (A) will be the key inflection points, so if we do head lower, then bears may want to increase caution near those levels). I really have no clear reason in SPX (by itself) to favor a near-term bearish outcome... but I'm somewhat inclined to do so anyway. 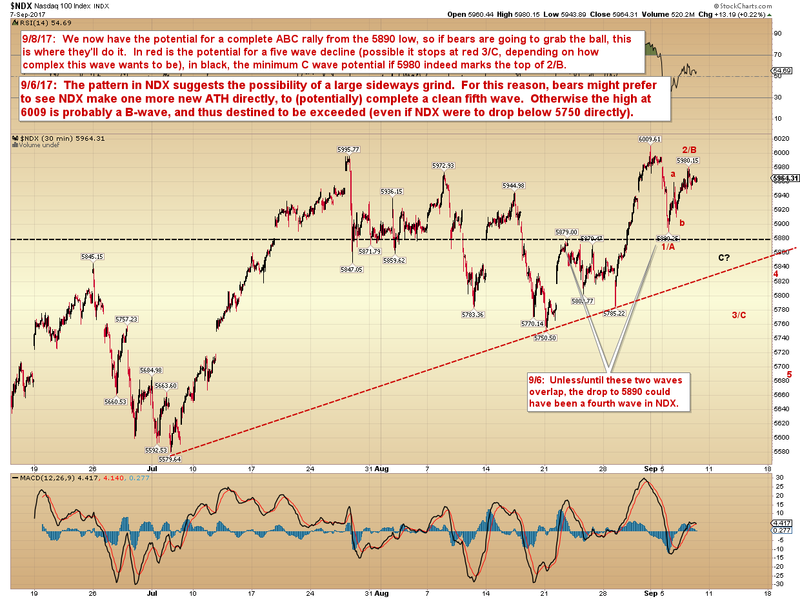 In conclusion, if bears want to try to get back in the game, NDX has reached an inflection point and the potential of a straightforward pattern. BKX is finally close to validating a predication made five months ago, and even if it holds here, it's declined enough to mean good news for bears who've been attacking the financials on that standing recommendation. 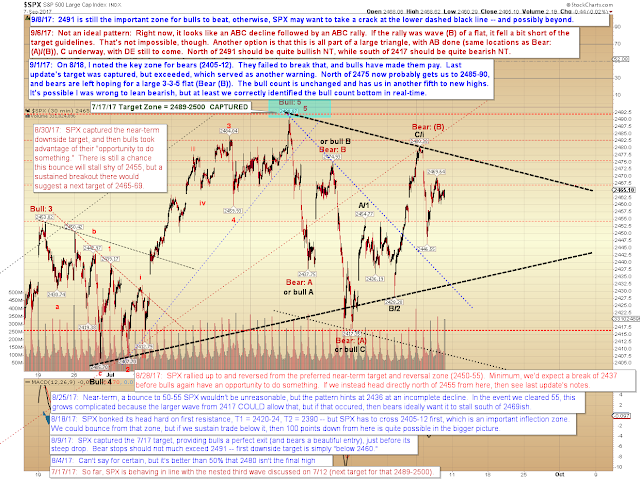 SPX is still a bit cryptic. The near-term pattern there can be counted as a complete ABC rally from 2446 to 2469, but leaves just enough room for doubt that I can't rule out the possibility for it to decline slightly, then rally again toward the upper black trend line, before reversing again and heading toward the lower trend line (if it ever does head to the lower trend line, of course). Despite the tight calls, I'm still inclined to give the overall nod to bears at the moment, and suspect we'll break 2446 before we see the market above 2480 again ("before" as in "I'd sell my right leg before I'd smile at Bernanke!" Not "before" as in "this, then this other thing immediately follows." This verbiage has caused confusion before, so I'm hoping to head that off.). Trade safe.